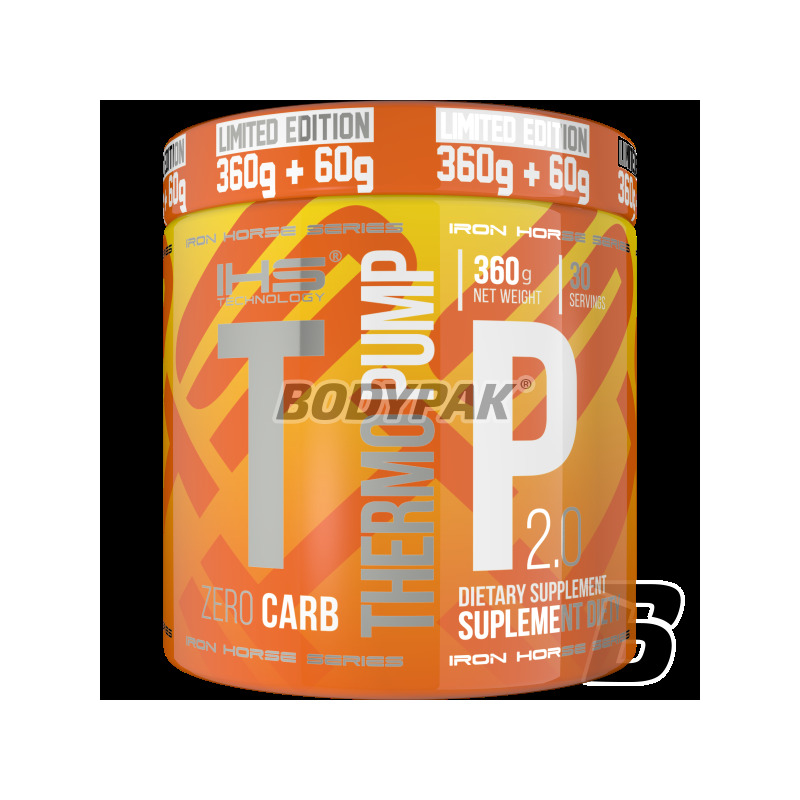 A unique dietary supplement support while burning excess fat and improves the strength for the purpose of training. IHS Thermo Pump - 1 sasz. 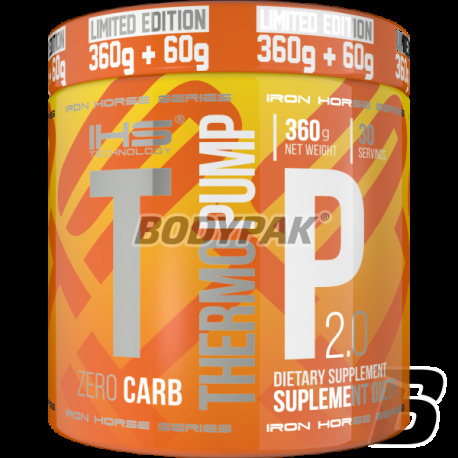 IHS Thermo Pump unique dietary supplement support while burning excess fat and improves the strength for the purpose of training. Comprehensively selected ingredients ensure an efficient and quick action. Raspberry ketones contained in the Iron Horse Thermo Pump is a completely new weapon in the fight against fat. Naturally occurring in fruits raspberries (lat. Rubus Ideaus) fragrances, which in chemical structure closely resemble known to all the basic components of a number of burners: capsaicin and synephrine. These sister chemicals occur naturally in cayenne pepper and bitter orange. How, then, contained in raspberries fragrances can promote fat burning? The answer is simple - very much like synephrine and capsaicin, so raspberry ketones are a perfect complement to comprehensive preparations to support the reduction of fat in the way of thermogenesis. Beta Alanine supports the development of strength and endurance during intense exercise. Beta-alanine dipeptide forms responsible for "deacidification" fast-twitch muscle fibers, allowing for even more prolonged training and the increase in its intensity, as well as accelerate the process of regeneration and reduction of post-exercise muscle soreness general accompanying exhausting workouts. Beta alanine also ensures proper work ATPase, an enzyme involved in the release of energy, which directly translates into increased ability of our body to make the effort. Evodiamine is an extract from a plant Wu Zhu Yu. It is also having a thermogenic effect of stimulants. There are no known side effects of taking ewodiaminy. Studies in mice have shown efficacy in reducing ewodiaminy hangover symptoms and therapy aimed at reducing fat. Ewodiamina is a substance of natural origin (its source is plants of the family Rutacea) należącado alkaloids, showing thermogenic and stimulating. The mechanism of action is most likely to stimulate vanilloid receptor leads to enhanced production of heat (thermogenesis) and thus bigger energy expenditure and fat burning faster backup. It works backwards range it is similar to the operation of capsaicin. The sports supplementation ewodiamina is used most often with caffeine, polyphenols from green tea and other compounds thermogenic effect as part of helping to reduce body fat in weight control programs. Arginine which is a precursor of nitric oxide dilates blood vessels and thereby increases the efficiency of training, it increases the flow of blood and can also increase the amount of oxygen delivered to the heart and other muscles. It can also improve erection. Practitioners benefit from increased physical function and increased blood flow. More nutrients reach the muscle and the side effects associated with fatigue are removed faster and more efficiently resulting in faster regeneration and other benefits. Arginine HCl can accelerate the healing process of micro-defects in muscle tissue and may also have a beneficial effect on growth hormone production, insulin sensitivity. Schizandrol A is a substance acting soothing effect on the nervous system, abolishing mental tension and preferably also affects the libido and regenerates and osłaniająco on liver cells and supports the immune system. Pilot studies have shown that an extract of magnolia Chinese has an impact on the economy of energy organisms assisting the creatine forming agent had previously mentioned ATP. The extract from Avena Sativa also contains a lot of valuable substances that block matters restricting work of testosterone. Affected thereby increasing the level of testosterone and actively affect our body. This extract works perfectly with substances that release natural testosterone causing an ideal destination effectiveness of the supplement. In order to promote the effectiveness of the product has been enriched with vitamin B6, which intensifies assimilation of active ingredients of the supplement. Thermo Pump z powodzeniem można nazwać produktem godnym polecenia. Skład elegancki: super pobudzenie, bo jest i imbir, yerba, ekstrakt z gorzkiej pomarańczy ale nie ma typowej kofeiny spotykanje w spalaczach, której skutków osobiście nie lubię. Także jest fajne rozgrzanie i pobudzenie. Do tego super smak (przynajmniej tropic, który próbowałem), są witaminki dla wzmocnienia i beta alanina. Generalnie skład kompletny jeśli chodzi o udany trening. Konkretny materiał! Thermo Pump dodaje mocy, elegancko rozgrzewa, znakomita przedtreningówka na redukcji oraz podczas aerobów na świeżym powietrzu. Wtedy chyba sprawdza się najlepiej. Odczuwalnie rozszerza naczynia ;-) Pozdrawiam! Mam go. brałem przez 3 dni - połowę zalecanej miarki. Działa, kopie. Pobudzenie 6/10, potliwość 7/10, smak - oryginalny trzeba się do tego przyzwyczaić, wolałbym to w tabsach albo inny monotonny smak typu mango albo jadody. Ale jest ok. po weekendzie lece w cała miarką. POLECAM! Będę testowac jak go dostanę do rąk. Dlazcego na to się zdecydowałem? Bogaty skład, połączenie przedtreningówki i spalacza - coś co szukałem i to pierwszy tego typy suplement na rynku. Znajac firme IHS jestem pewien ze smak i rozpuszczalnośc 5/5 ;) a czy robi robotę to się okaże .. dam znać jak bedę go brac tygdzień już. Wzięłam go dla narzeczonego, zobaczymy efekty i dam znac za miesiąc. Jest zadowolony z mojego wyboru tej odżywki. Na pewno pali podczas ćwiczeń .Czuć potliwość większą. Jako spalacz tłuszczu średnio, ale pre + spalacz - znakomite połączenie.. kwestia samego zastosowania i zalet przy okazji. Trec S.A.W. [10g] - 1 sasz.